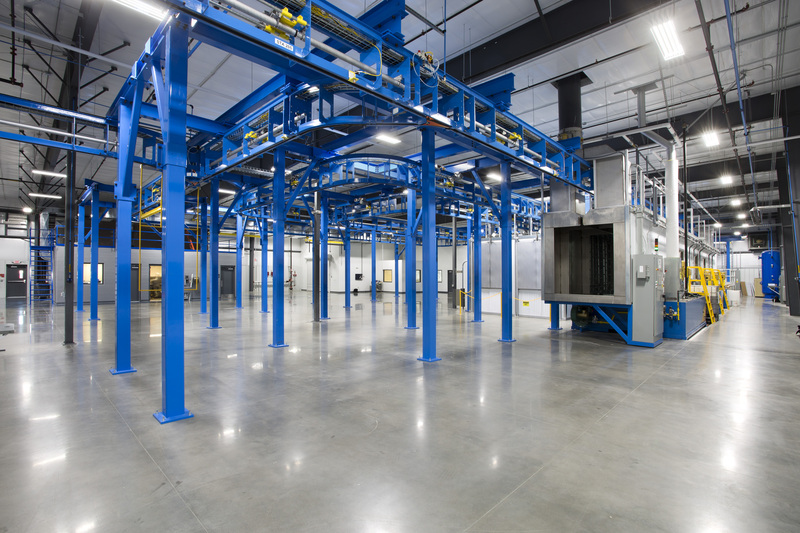 Modular construction requires less installation time (up to 50% less). 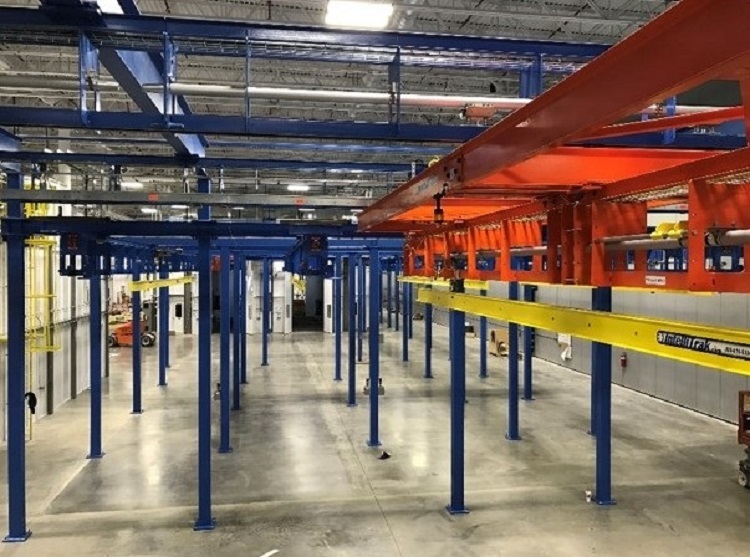 IntelliTrak systems use less floor space (up to 40% less) due to forward and reverse capabilities, optional switches, curves, lifts, and shuttles. No chain makes maintenance simple. 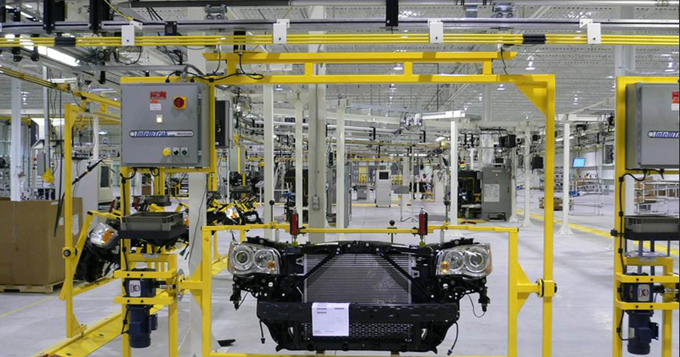 Zone control results in less wear and tear on parts. 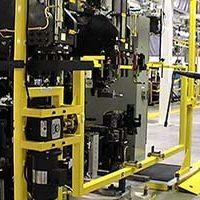 Repeat customer, Tier 1 Automotive supplier, adds new vehicle line, expands system and saves money, all without missing a beat. 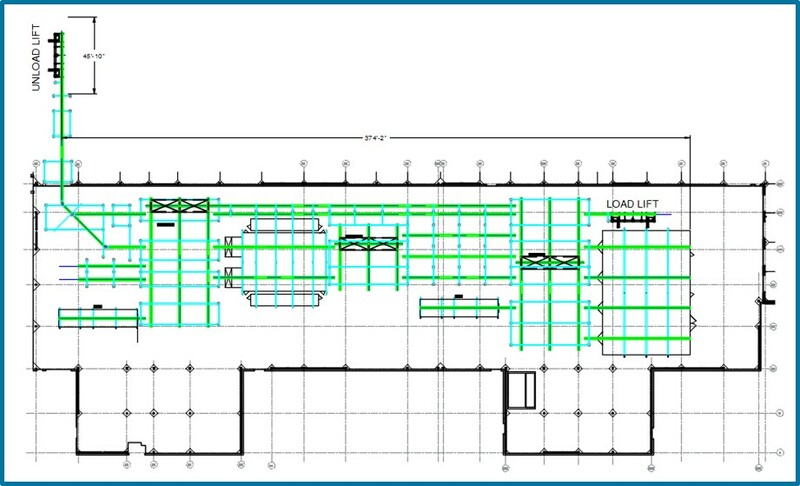 In 2006, IntelliTrak installed a system in the customer’s new building. 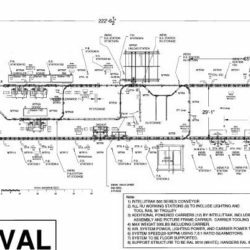 When they were awarded a new contract in 2015 for a new vehicle, they had a choice: purchase a new conveyor system or modify the existing one. The inherent flexibility of the IntelliTrak 500 Series Overhead Conveyor made the decision simple: MODIFY it! 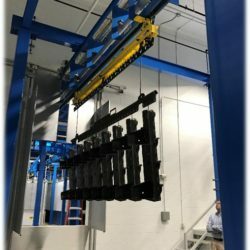 Instead of having to build an entirely new system (as they would have had to do with a traditional power and free chain system), IntelliTrak was able to remove part of the old system, add new conveyor onto the old system, even reusing some of the existing system, and save the customer thousands of dollars in both equipment and downtime. 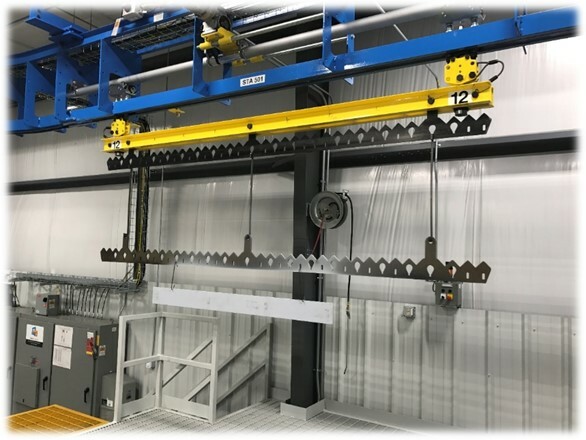 IntelliTrak provides aerospace manufacturer a creative solution for moving a very long part in a small space. 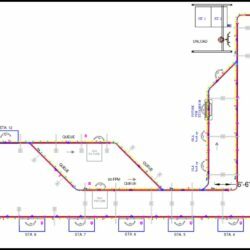 Manufacturer of aerospace components needed finishing conveyor system for long composite plane part. 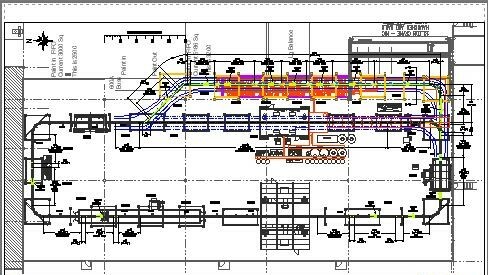 With limited space for new construction and multiple lanes and lifts required for throughput, a standard conveyor system just wouldn’t work. 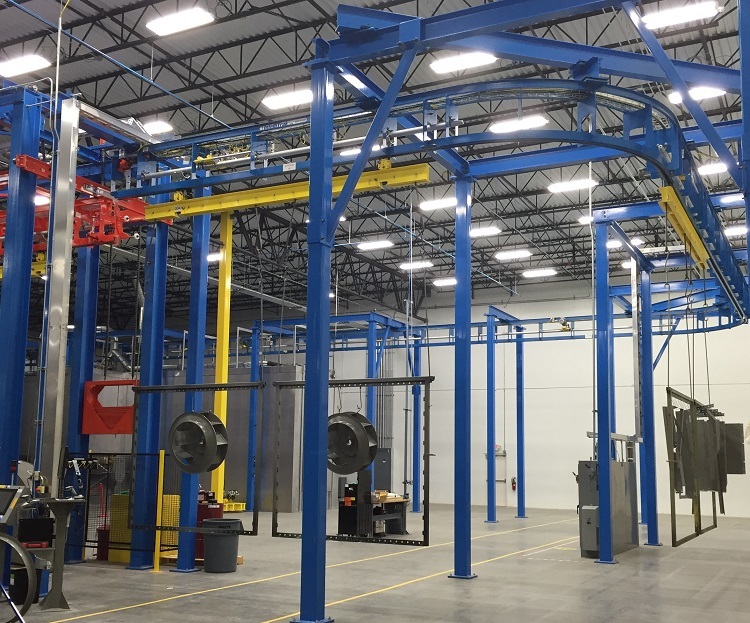 IntelliTrak designed, manufactured and installed the 1500 Series overhead conveyor with a 36’6” load bar and a double trolley carrier. 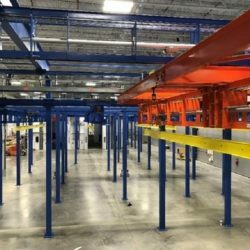 To efficiently move the over-sized load bar in the narrow floor space, IntelliTrak installed 3 shuttle assemblies that fed into 20 shuttle stop assemblies and an empty carrier return lane (saving floor space and construction costs). 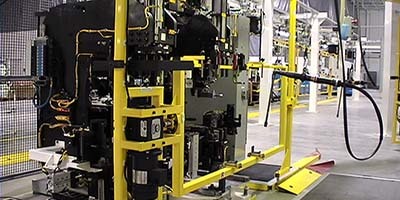 The added functionality of the forward/reverse ability of the IntelliTrak system improved the overall process. And the solution for lifting a 36’ load bar? 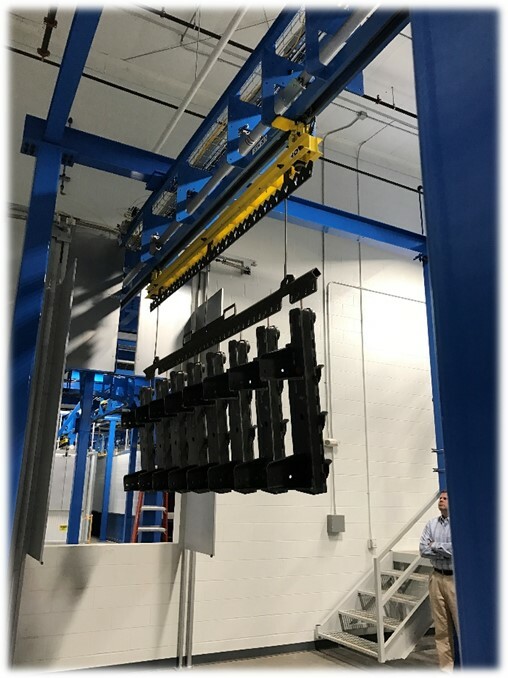 A custom-designed double split-cantilever lift with a single drive shaft. Problem solved. 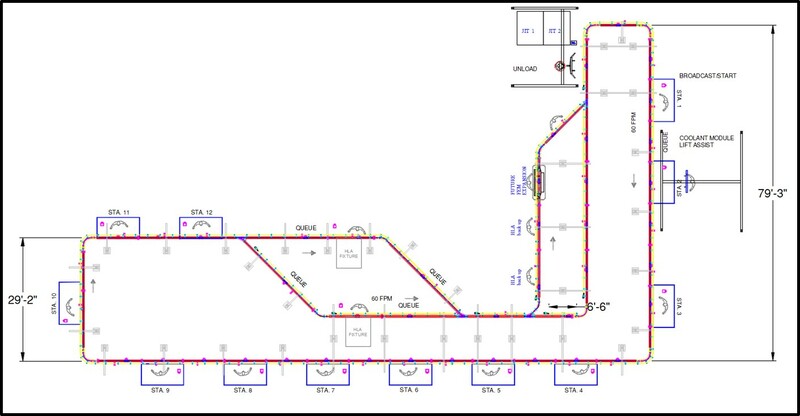 Modular design of conveyor allows for expansion with minimal cost and downtime. 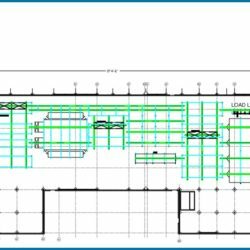 A supplier of air movement and control equipment needed a conveyor system for their new building. Requirements included a maximum carrier weight of 1200 lbs. and a lift with a long stroke of 13’ 3” and access from the back side of the lift. 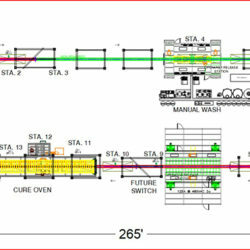 Budget constraints required a system that could be easily modified in the future to add more functionality. 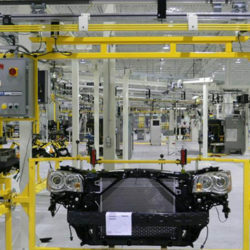 In 2013, IntelliTrak installed a 1500 Series Overhead Conveyor System to meet their 1200 lb. 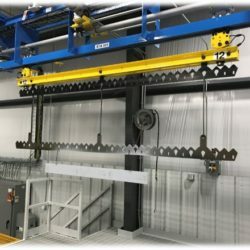 max load requirement and a custom-designed, split counterweight 4-post lift that left space between counterweights for access to back side of the lift and able to accommodate a 24 ft. load bar. 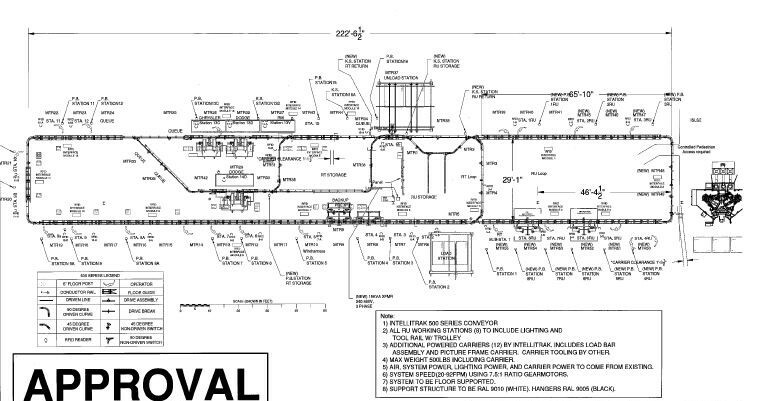 The design also included switch cut-ins (5 ft. of conveyor) for future expansion. 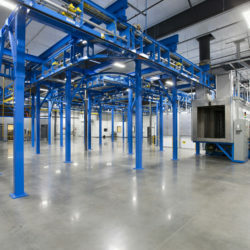 Metal fabricator installs state-of-the-art IntelliTrak conveyor system, expanding capabilities, opening up new markets. 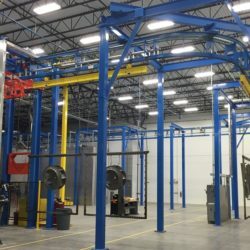 A family-owned metal fabricator required flexibility in its overhead conveyor–flexibility that would enable them to accommodate a variety of part sizes, a wide range of job quantities, as well as custom part recipes and processes. The IntelliTrak 1500 Series provided that flexibility, greatly expanding company capabilities and ultimately, opening up new markets for them. 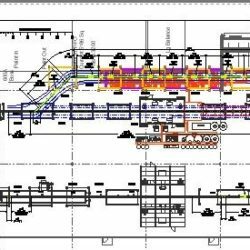 And with the capability to complete jobs in-house, they are also able to reduce throughput time and better control the quality of the finished product.